The confirmation hearing for Donald Trump’s billionaire Education Secretary pick, Betsy DeVos, on Tuesday was frankly outrageous, the most eye-catching item being DeVos’s assertion that states should be more open to allowing guns into schools for protecting students against grizzly bear attacks. Now the vote on whether or not to confirm DeVos has been delayed, though not because of bears. 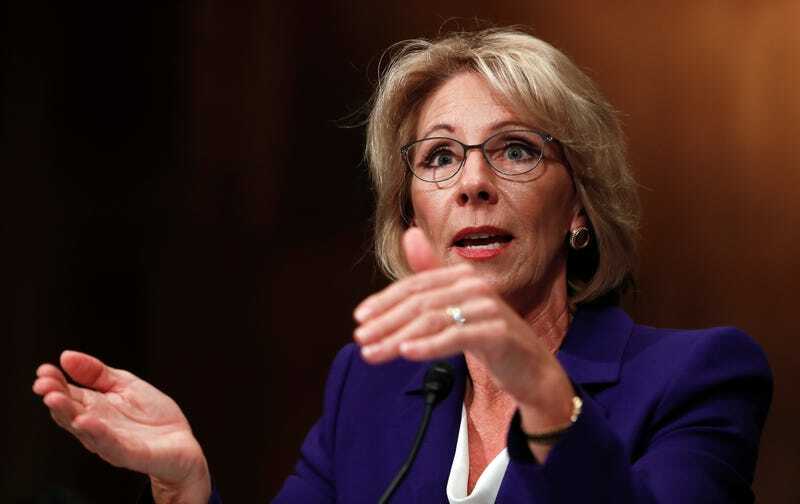 On Friday, Republican Senator and chair of the Senate Committee on Health, Education, Labor and Pensions, Lamar Alexander, pushed back the date of Devos’s confirmation vote by a week to January 31. According to Alexander’s office, the vote was delayed to give Committee members more time to review DeVos’s recently released financial and ethics disclosure. Alexander had previously stated that the vote could proceed this upcoming Tuesday if the Office of Government Ethics finalized DeVos’ financial disclosures and ethics paperwork by the end of this week. The Office release these disclosures on Friday morning, but the vote was delayed anyway. According to the Associated Press, DeVos has pledged in these newly released documents to step down from various positions she holds with school choice advocacy groups and to divest her interests in 102 companies within 90 days, if confirmed. Among the companies DeVos will divest from is a debt collection agency, LMF WF Portfolio, that does business with the Education Department, Politico reports. [DeVos] is, however, retaining her position as co-trustee of three family trusts, at least one of which has an indirect financial stake in Sextant Education, which operates a chain of for-profit colleges, through its parent company AEA Investors. Though DeVos lists AEA as one of the assets she intends to divest, its unclear whether she would retain a partial stake through the trust. And the other two trusts have no assets listed, so there is no sense of whether they have investments in other education companies. The nominee’s spokesperson did not immediately respond to requests for comment. Eli Zupnick, spokesperson for Committee Democrats, described DeVos and her family’s ties to the education industry on Friday as “incredibly opaque financial entanglements,” which undoubtedly warrant more than a couple hours of review.